These have been around for awhile, but the price has come way down. 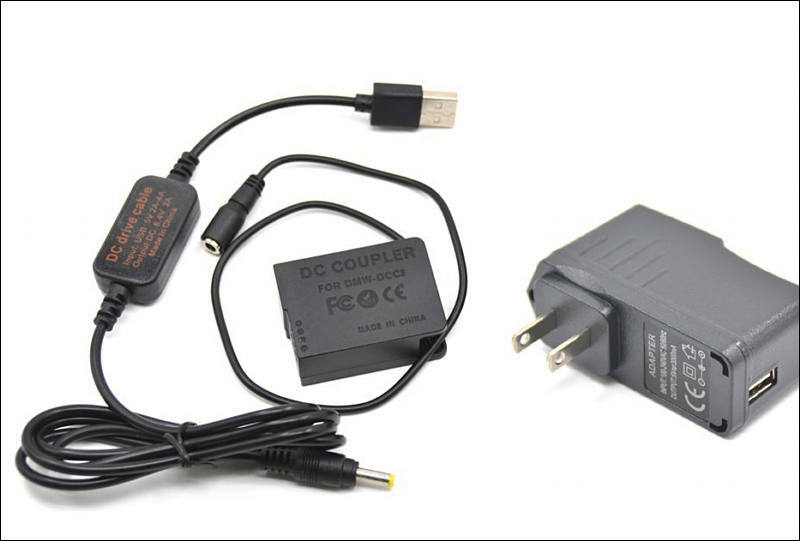 Basically, it's a USB DC-DC converter that lifts the standard USB 5 volts to, for example, 8.4 volts for Panasonic. There's another model that has two USB inputs, so you could use two power banks or use one and draw more amps. I was skeptical, and the packaging made me even more so, cardboard & crinkly shrinkly, but I plugged it into my cheapest 5200mah power bank and measured the voltage. 8.8 volts, which is just about right (I've gone as high as 9.2, but prefer not to). Notably, the needle on my trusty voltmeter did not wiggle. Also noteworthy, it didn't seem to need the recommended 3 amp draw. It comes with a 3 amp wall wart if you just want to plug the camera into the mains for power. It comes with a bog standard dummy battery. The step up converter is tiny, not much thicker than the cable. Plugged in the camera (Panasonic G7) and waited. The 5200mah power bank ran the camera for 156 minutes, or two and one half hours. Not bad--you are going to lose some power in the conversion so don't skimp on the power bank. I'll do some tests later with my RAV 20,000mah bank. Camera ran cooler than expected. So there you have it, easy, lightweight power from USB. I had been using 9 volt packs with stacks of Panasonic 18650 cells (runs forever....). But this is really easy. You can buy adapters for most cameras, and considering the fact that it comes with a dummy battery, the price is cheap. Will it burn out? Interesting question. I think it is more correct to call it DC-DC converter, not transformer. Imagine how long a camera would run with a 30,000mAh bank! Just bought one of these too, received last week, have to test it today. Curious how it converts from 5v to 8.8v, is it some kind of inverter? I didn't open it, but DC-DC is fairly common. Even the Schoeps mic preamps or RME gear can take different sources and convert it. You lose some power in the conversion, but a good power bank will run this camera a really long time. I will try it with a measured battery, the Panasonic 18650, to get a "conversion" rate, since it is more than two times the stock battery. But if you have a 30,000mah power bar, does it matter? It will run for a really long time. Most power banks exaggerate their mah rating, but some don't. @Marciok let me know how it goes. Looks the same as this https://www.aliexpress.com/item/DMW-BLF19E-DCC12-dummy-battery-USB-charger-Cable-fits-mobile-Power-Bank-3A-power-for-Panasonic/32796938082.html Have 2 of these. Have been using 10 times over the last month now with gh5 and gh4. No problems yet. Yep. Looks the same. Good times. Here's the GH2-G5-G6-G7-G85 etc one--you can save a few dollars if you order it without the wall wart. Any suggestions for VW-VBG260 or VW-VBG130 bateries ? Perhaps a universal camera grip that attaches to the tripod screw only ? Also super confusing video that you don't need to watch. @zcream maybe a huge clone battery? To complete this thread, a Rubber Lined Pipe Clamp, or more commonly known amongst plumbers as a Rubber Lined Munsen Ring - has a 3/8" thread that will convert to a coldshoe or tripod mount easily and you can clamp your battery to the camera. Here is a review of some external USB batteries. Those little 18650 size power banks sometimes go below .5 amps and won't drive the converter. They are super compact, though. A well designed one will, but, everyone, if you use the converter look for a 2A bank (or higher). I ran the converter on a 1 amp supply no problem, but 2 is safer. Look for a good brand with the amp spec on the back. Of the ones on the whatdigitalcamera site the Anker and the Rav are good, I wouldn't get the Jackery. They don't mention the Anker PowerCore 13000 which has four 18650 battery cells and cranks out 3 amps. Very compact, well-made power supply. Starving the beast: I used my RAV 13000 mah to run the G7 for 8 hours with three breaks in between. At the end of the charge, the camera stopped a few times. I also noticed that the rec SD card icon started blinking (remember the GH2?). The power didn't drop, or the battery light would have come on, so I am guessing the current was intermittent. Sometimes I got "recording stopped becasue of card speed" message. At the very end of the power bank charge, the camera corrupted the SD card making it unreadable. So, don't run it all the way down. A 1200mah real battery foes about 1.5 hours recording, so you get about half of what you should get with the converter, which is fine becasue it's hours and hours. Camera ran cooler than with battery or 9v dedicated battery pack. Not much cooler, but cooler.